Richard Nelson, a volunteer with Trafford Local Studies, has been researching Trafford servicemen awarded medals or distinctions for gallantry, distinguished service or meritorious service. Captain Eric Gilbert Leake, 48th Canadian Highlanders, 7th Manchester Regiment, RFC and RAF, (1893 – 1918) M.C. Captain Russell Medley Leake, 3rd Battalion, attached 1st, Loyal North Lancashire Regiment (1894 – 1918) M.C. and Bar. Captain Kenneth Harper Leake, 1st Battalion Loyal North Lancashire Regiment, RAF, (1896 – 1980) M.C. To be awarded a Military Cross is an outstanding achievement and a testament to true bravery. To achieve three in one family is surely astonishing. Research in the Altrincham, Bowdon and Hale Guardian identified that three of the four sons of Florence and James Medley Leake, a grey cloth agent for JB Lee’s, Son & Roberts of Brazenose Street, Manchester, all won Military Crosses. Further research in a wide range of sources has revealed more of their remarkable stories. The three boys were born in Fallowfield, Manchester, before the family moved to Wood Hill, Harrop Road, Hale, by the time of the 1901 census. They were living at Ardencraig, Ollerbarrow Road, Hale, at the 1911 census and through the war period. All three boys attended Sedbergh School, as did their older brother, Gordon Lee Leake, who had established himself as an accountant in New York by the time war broke out. Eric Gilbert Leake was born on 26th January 1893. He started at Sedbergh Preparatory School in 1901, after a period at Wadham House School, Hale. He became Head Boy at Sedbergh Preparatory School before moving to the main school in 1906. Here he played rugby and sang in choral competition for his house teams and joined the Officer Training Corps where he reached the rank of Lance-Sergeant in March 1910. He left Sedbergh in 1910 and worked for the Lancashire and Yorkshire Bank for nearly three years before moving to Ontario, Canada, in 1913 to work as a bank clerk for the Royal Bank of Canada. At the outbreak of war, he joined the 15th Battalion, Canadian Infantry and went with them to France in February 1915. He was wounded fighting for the 48th Canadian Highlanders in April that year. He attained the rank of Company Quartermaster Sergeant with the Canadian forces and, on 28th November 1915, he transferred to a commission in the 7th Manchester Regiment. He saw active service with this regiment, and was promoted to temporary Lieutenant by the end of December that year. Like many army officers he took the opportunity to experience the excitement of the Royal Flying Corps. He joined this in September 1916 and gained his Royal Aero Club Aviator’s Certificate in January 1917. Now a temporary Lieutenant, he was formerly seconded to the R.F.C. in March 1917. He flew with 59th Squadron in RE 8 two-seater aircraft, designed for bombing and reconnaissance. Flying was a dangerous business. His aircraft was damaged in combat with an enemy aircraft while on a photographic mission on 8th April 1917, in the period before the Battle of Arras, when the crews of the other three British aircraft in the patrol became casualties. He sustained slight wounds from anti-aircraft fire in May and June that year. He was shot down over the Collincamp area in March 1918, but he and his observer returned safely, despite his aircraft being destroyed. Next month he was appointed Flight Captain of 59th Squadron. 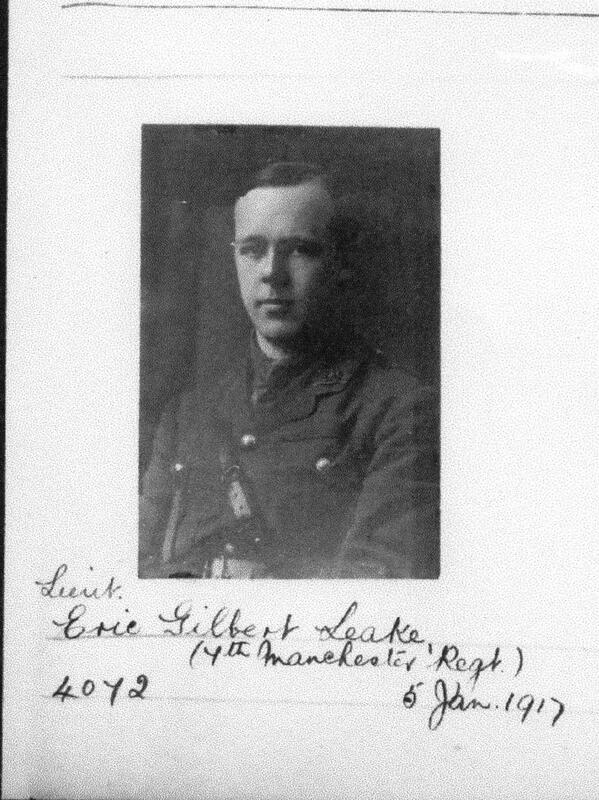 On the 1st July 1918, Eric, now Captain Leake, was at home on a short leave. On return to France, on 24th July, the day after rejoining his squadron, he was wounded when his aircraft came under heavy anti-aircraft fire. His R.A.F. Service Record notes him as being in a Casualty Clearing Station on 29th July and his Sedbergh School obituary states that there were hopes of his recovery. That was not to be. He had sustained a broken blood vessel in his brain and died in hospital of his wounds on 31st July 1918. A fellow officer wrote of him as: “One of the best, popular with his squadron, and an excellent Flight Commander.” He is buried at Bagneux British Cemetery at Gezaincourt. His brother Russell Medley Leake attended his funeral. In 1913 he left Sedbergh to continue his education as a Classical Exhibitioner at St John’s College, Oxford. The war intervened and, despite what his school described as “his intense hatred of militarism”, he enlisted in the Public Schools Battalion in August 1914 and went to France in November that year as a private in the 19th Royal Fusiliers. His leadership qualities were quickly recognised, and in August 1916 he was awarded a commission with the 3rd Battalion, Loyal North Lancashire Regiment. He gained a Bar to his M.C. in November 1917 and was promoted to Lieutenant in February 1918, having already held the role of Acting Captain. By the time of his death on 18th September 1918 he was a Captain, commanding B Company of the 1st Battalion, Loyal North Lancashire Regiment. On that day his regiment was involved in an attack to capture high ground held by the Germans to secure part of the start line for the assault on the Hindenberg Line. According to the Regimental History, he was killed by machine gun fire in a German counter attack as his company were attempting to take Villemay trench, near Holnon village in France as part of the Battle of Epehy. His Colonel’s words describe his qualities as a soldier: “I have never met a more fearless man… His act by which he gained the Military Cross on 6/7th March 1917, was one of great bravery… He is buried at Bellicourt Cemetery. A sum of money was bequeathed to Sedbergh School by the estate of the late Russell Medley Leake, as the nucleus of a fund for providing an annual “Chamber Concert” at Sedbergh; himself a great lover of orchestral music, he wished that musical enthusiasts at the school should have a regular opportunity of hearing good instrumental music. 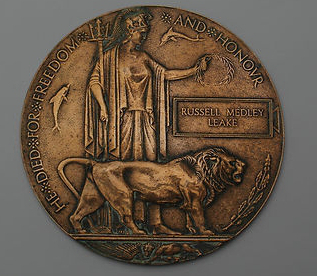 Death Penny of Russell Medley Leake (source unknown). 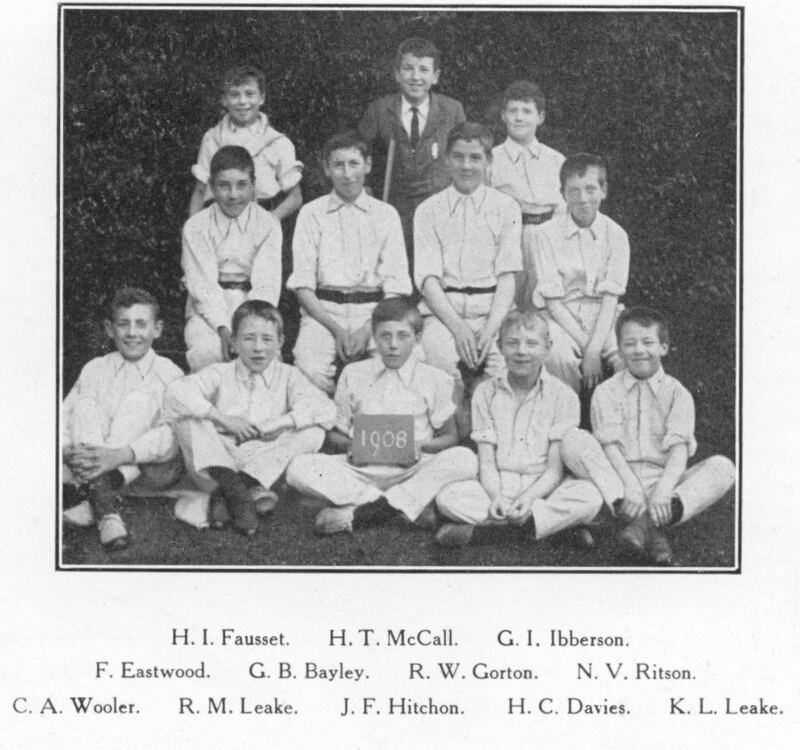 Kenneth Harper Leake, the youngest of the brothers, (born 30 July 1896) attended Wadham House School, Hale, and Sedbergh Preparatory School and played cricket for this school’s team in 1908. Moving to the main Sedbergh School in 1910, his achievement there seems to have been mainly in the field of sport. In July 1911 he gained his Colours for First XI Cricket team and became Captain of Cricket in 1913, though was forced to resign his captaincy through illness. He represented his house teams at gymnastics and rugby and played for School under 16 rugby team in 1911. On leaving school in 1913, he attended the Royal Military College and was awarded a commission as 2nd Lieutenant in the 1st Loyal North Lancashire Regiment in March 1915. He went to France at the beginning of October 1915 and was promoted to Lieutenant in December that year. “For conspicuous gallantry in action. After an attack he took out a patrol with a machine gun, and established a post to protect the right flank of the outpost line, though the enemy were still in position on the flank and rear and were using machine guns.” He lost his right arm in subsequent action at High Wood. Presumably it was this that forced him to relinquish the office of Temporary Captain in November 1916. Both the Yorkshire Post and the Sedberghian Magazine report the Royal Visit to Sedbergh School on 18 May 1917 to inspect the school contingent of the Officer Training Corps. King George V and his wife, Queen Mary, were introduced to Kenneth and spoke kindly to him. On 22 November 1917 Kenneth married Hilda Cunningham Hacking at St Stephen’s Church, South Kensington. Unfortunately she died during the last three months of 1918. At the beginning of June 1918 Kenneth returned to war service and was appointed as Lieutenant in the Administrative Branch of the RAF as an Assistant Adjutant and on 28th September moved to 5 Training Depot Station at Easton on the Hill, Northamptonshire. However he was admitted to Wothorpe Hospital on 9th October for a short period and was placed on the half pay list on account of ill health caused by wounds in January 1919. He was admitted to Wothorpe again at the end of March and retired at the end of November 1919. In January 1920 he travelled to New York on the SS Royal George, possibly to visit his brother Gordon who lived there. In November 1922 he announced his engagement to Gwyneth Mary Brownrigg Jay and married her in Dorset on 18 August 1918. She petitioned for divorce in 1927. No children have been located with certainty. He lived in London after this and in Croydon from the late 1950’s until his death in 1980. Thanks to Katy de la Rivière, Archivist at Sedbergh School for information and a superb resource in the Sedberghian magazine on line. Thanks to Andrew Darwent, Trustee, Royal Aero Club Trust and Andrew Jackson of the pals.org.uk website for permission to use photographs. Thanks to staff at Trafford Local Studies for support and encouragement. Sources: RAF Service Records,The Royal Aero Club Trust, The London Gazette, the Great War Forum at 1914-1918.invisionzone.com, The Manchesters website – www.themanchesters.org, The Loyal North Lancashires website www.loyalregiment.com, www.number59.com, www.canadiangreatwarproject.com, The Manchester Guardian on line, Trafford Ward Dead website, Ancestry.co.uk and FindMyPast.co.uk for census, birth death and marriage registrations, parish records, passenger lists etc. Hi, when I moved three years ago I found whilst clearing an old cupboard a autograph book 1914 -1918 with quite a few references to Hollywood Park, ( Patients) the book is a piece of history, do you need it for your archives It names servicemen and there are beautiful illustrations and poems. the autograph book sounds really interesting, please contact Trafford Local Studies via trafflocals@trafford.gov.uk to let them know you have it and see if they would be interested in taking it in. I am writing a short article on the contribution of soldiers of the Territorial Force in the North West of England and the next will feature those such as Captain Eric Gilbert Leake who went on to serve with the Royal Flying Corps. Publication is in ‘The Volunteer’ issued free of charge ( I am also free of charge!) to serving members of the Reserve Forces (Royal Navy, Army and RAF) and to civic institutions across the North West of England and the Isle of Man May I use some of the information from this blog post please?